UPDATED: Sun., April 15, 2018, 10:25 p.m.
WASHINGTON – Former FBI Director James Comey says he thinks it’s possible the Russians have compromising information on President Donald Trump, that there is “some evidence of obstruction of justice” in the president’s actions and that Trump is “morally unfit” for office. 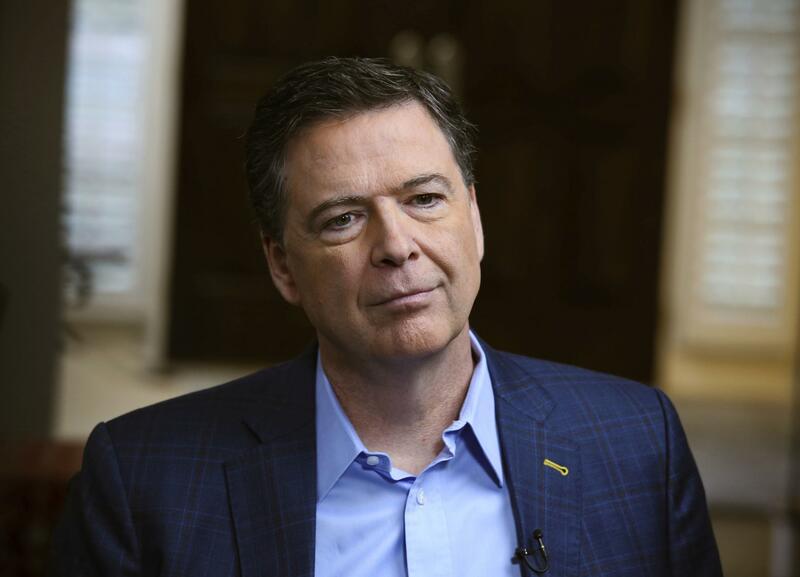 Comey’s televised remarks, coupled with the release of his forthcoming book, offer his version of events surrounding his firing and the investigations into Russian election meddling and Hillary Clinton’s email practices. Several of the episodes he describes in detail, including a private conversation about former White House national security adviser Michael Flynn, are central to special counsel Robert Mueller’s Russia investigation and his recollections are presumably valuable for prosecutors examining whether the president’s actions constitute obstruction of justice. The FBI director, who until his firing last May led an investigation into possible ties between Russia and the Trump campaign, acknowledged that it was “stunning” to think Russia could have damaging information on an American president. But he said in Trump’s case, he could not discount the possibility that the president had been compromised. “These are more words I never thought I’d utter about a president of the United States, but it’s possible,” Comey told ABC News’ chief anchor George Stephanopoulos. He also answered “possibly” when asked if the president was attempting to obstruct justice when he cleared the Oval Office of other officials last February before encouraging him to close the investigation into Flynn, who by that point was suspected of lying to the FBI about his Russian contacts. The retired general pleaded guilty last December and is now cooperating with Mueller’s investigation. “A person who sees moral equivalence in Charlottesville, who talks about and treats women like they’re pieces of meat, who lies constantly about matters big and small and insists the American people believe it – that person’s not fit to be president of the United States, on moral grounds,” Comey said. Trump on Sunday rejected Comey’s assertion that the president had sought his loyalty at a January 2017 dinner, saying “I hardly even knew this guy. Just another of his many lies.” He also suggested Comey should be imprisoned, saying, “how come he gave up Classified Information (jail), why did he lie to Congress (jail).” There is no indication Comey is under investigation for doing either. The president’s attacks on Comey began even before the interview aired. That argument was startling given that Comey’s handling of the email investigation, including his disclosure shortly before the election that the FBI had reopened its probe, enraged Democrats. After Clinton’s loss, many Democrats blamed Comey, and Clinton herself has said it hurt her election prospects. Former Attorney General Loretta Lynch pushed back against Comey’s criticism in the book that, early in the Clinton email inquiry, she had instructed him to refer to it as a “matter” rather than an “investigation.” In a statement Sunday, Lynch said she was simply following longstanding Justice Department protocol against confirming or denying the existence of an investigation. Trump’s firing of Comey set off a scramble at the Justice Department that led to the appointment of Mueller as special counsel overseeing the Russia investigation. Mueller’s probe has expanded to include whether Trump obstructed justice by firing Comey. So far, 19 people – including Flynn and Trump’s former campaign chairman, Paul Manafort –have been charged in the investigation. Flynn and two of the president’s campaign aides, Rick Gates and George Papadopoulos, have pleaded guilty and are cooperating with Mueller. Published: April 15, 2018, 11:01 a.m. Updated: April 15, 2018, 10:25 p.m.